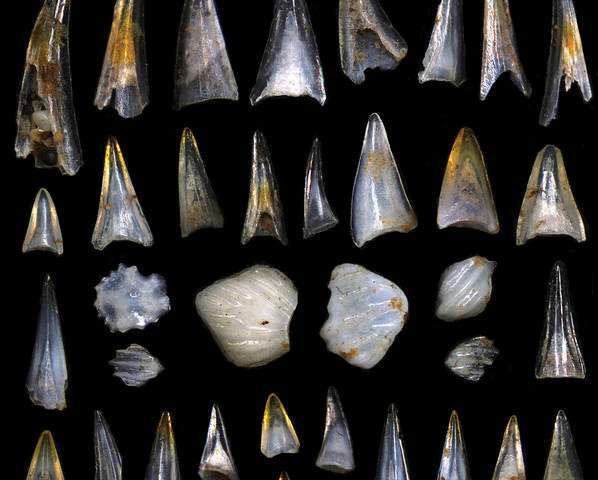 An assortment of Early Cenozoic ichthyoliths (fish teeth and shark scales) from the South Pacific Ocean following the End-Cretaceous Mass Extinction. Scale bar is 500 um. Credit: E. Sibert and B. House. A pair of paleobiologists from Scripps Institution of Oceanography, UC San Diego have determined that the world's most numerous and diverse vertebrates – ray-finned fishes – began their ecological dominance of the oceans 66 million years ago, aided by the mass extinction event that killed off dinosaurs. "We find that the extinction event marked an ecological turning point for the pelagic marine vertebrates," write the authors in the study. "The K/Pg extinction appears to have been a major driver in the rise of ray-finned fishes and the reason that they are dominant in the open oceans today." "The diversification of fish had never been tied to any particular event. What we found is that the mass extinction is actually where fish really took off in abundance and variety," said Sibert, who is the recipient of an NSF Graduate Research Fellowship. "What's neat about what we found is that when the asteroid hit, it completely flipped how the oceans worked. The extinction changed who the major players were." "What's amazing," said Norris, "is how quickly fish double, then triple in relative abundance to sharks after the extinction, suggesting that fish were 'released' from predation or competition by the extinction of other groups of marine life." "Mammals evolved 250 million years ago but didn't become really important until after the mass extinction. Ray-finned fishes have the same kind of story," said Sibert. "The lineage has been around for hundreds of millions of years, but without the mass extinction event 66 million years ago, it is very likely that the oceans wouldn't be dominated by the fish we see today." The paper, "New Age of Fishes initiated by the Cretaceous-Paleogene mass extinction," appears June 29 in the early edition version of the journal Proceedings of the National Academy of Sciences.